Rory Trahair at Edmiston & Company sends news that Mike Horsley in the Antibes office has signed the 42.06m motor yacht Istros for sale. Built by Amsterdamsche Scheepwerf in 1954 to a design by De Vries Lentsch, she accommodates nine guests in five staterooms. 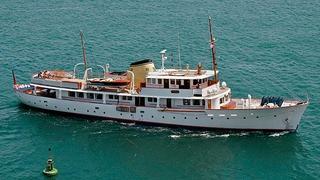 Istros is arguably the best original classic motor yacht afloat today. She was the winner of the grand prize for the best restored vessel at the Monaco Yacht Club Prada Classic Yacht Show in 2001 and her multi-million pound refit and refurbishment was finally completed in 2002. Today Istros offers a unique combination of classical elegance and modern creature comforts. While her restoration ensures that guests can experience style from a bygone era, they can also enjoy up-to-date facilities designed to guarantee the highest levels of comfort and luxury. Lying in Malta, her asking price is €5.95 million.